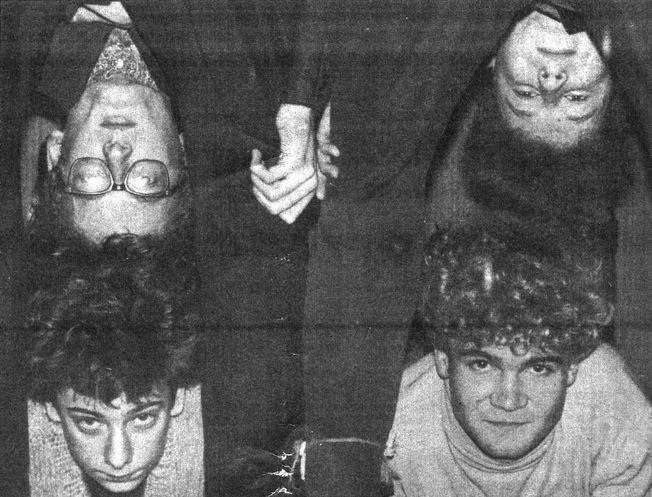 Heroes of the Beach, an on-and-off Sheffield scene 'supergroup' that Jarvis played with over the summer of 1982. 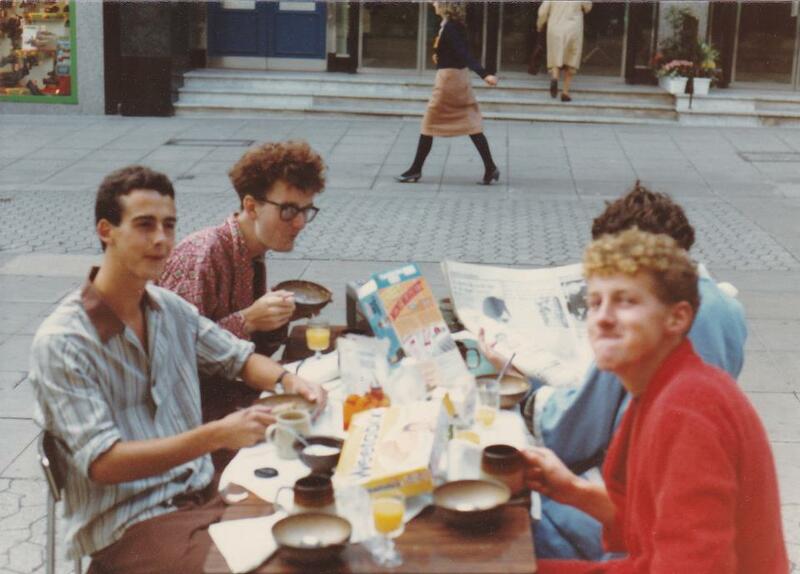 The autumn of 1982 showed even less activity than the summer, with the loose collection of friends, acquaintances and siblings that made up the band getting together for only a single public performance (on the 24th of October at the Crucible Theatre) and no recordings to note. The summer was over, Simon Hinkler was away, studying in Newark, and Jarvis’s efforts were presumably being focussed on preparing for the recording of ‘It’ in November. Now that Wayne had decided to move to playing guitar, and Garry Wilson was otherwise occupied with his day-job in Artery, Pulp were in need of a drummer. The replacement was Peter Boam, another of the faintly odd artistic types who played a role in the collective around this time. A multi-instrumentalist, though not a particularly competent drummer, he would appear on stage with his hair in a bunch, wearing a dress. Unfortunately this era is (as must be familiar by now) unrepresented by anything professionally recorded or in circulation. On a positive note, this is the last of these lists for quite a while. For the following couple of years, almost everything is available in some form, whether it deserves to be or not. The only track from the ‘Spice’ demo which hasn’t been released in some form, The Heat of the Day is apparently an outlier on the tape, sounding unlike both ‘old Pulp’ and ‘new Pulp’. Influenced largely by The Velvet Underground’s “What Goes On,” it took the late ’82 jangly organ-rock Pulp sound, ramped up the rock, and cut down on the jangly. Ultimately Pulp didn’t go in this direction, but the song would be interesting to hear nonetheless. This one was only performed at the Crucible Theatre concert before being dropped. Like ‘The Heat of the Day’ it featured David Hinkler’s psychedelic organ sound, with a roaming Stranglers-style bassline from his brother Simon. It survives only on an uncirculated practice tape. Another relic of the Crucible concert, this one was slightly older, dating back to the previous year. Apparently another Jarvis/Dolly uptempo punk-pop romp, it could well be the band’s last attempt at a novelty song before they started getting very serious indeed. Mr Morality was also performed by Heroes of the Beach, a not particularly serious group consisting of whichever local musicians were up for it at the time. Jarvis sang lead vocals in the band on a couple of occasions, and Steve Genn (another singer and one of the group’s founders) would take the title of the song as the name of his own group in 1983. Saskia’s real moment came when she took to the front of the stage to perform two songs – ‘I’m Thru With Love’, a 1950s ballad most famously performed by Marilyn Monroe in the film ‘Some Like It Hot’, and ‘When You Cry I Cry’, a song she co-wrote with Jarvis and Simon. After the ‘It’ era, Saskia stopped playing a role in the band, and her songs were consequently dropped. In early 1984, in what may have been their last performance, the whole line-up made the journey down to London to record the two songs professionally. The demo was sent out to various record companies with the goal of getting Saskia a recording contract, but nothing came of it, and the two songs were never released or circulated. A street in Rotherham, 1982. Click through for a superb ‘then and now’ photo gallery. In the catalogue of Pulp mark one, there is little more than a few crumbs of available material in a desert of the unrecorded, unreleased and uncirculated. Given the chance to unearth one tape from this era, I suspect that most would choose the Rotherham demo. The session features four tracks, none of which are available elsewhere, recorded at a time when the band were much more well-rehearsed and professional than before, and produced by a talented, sympathetic producer. Kaley Studios in Rotherham were a slight improvement on Ken Patten’s living room, but obviously nowhere near the standard of the BBC’s Maida Vale. It seems to have been little more than a bit of derelict office space with sound-proofing and an 8-track mixing desk. The session was produced by David Hinkler’s brother Simon, whose day-job was playing keyboards and guitar in Artery. With the help of the studio engineer he was able to get four decent recordings out of the band in the time allotted. From Mark Sturdy’s description, ‘Why Live?’ sounds pretty depressing. David plays mournful spanish guitar while Dolly joins in on the xylophone. Jarvis’s lyrics sound, on face value, to be indulgent teenage whining – “To moan and whine about my life is my perogative / Pessimistic overviews are all I have to give” – but the group were self-aware enough to know how silly po-faced whining could sound, so I suspect there may be more to this song. #25 – How Could You Leave Me? Here we find Pulp’s one and only attempt at playing Jazz. A slow-paced, bluesy thing, with one of Jamie’s walking basslines, Wayne’s swing rhythm, Dolly’s blues guitar licks and David playing the ‘vibes’ setting on his keyboard. Jarvis sings a warbly, melancholy vocal, and Simon joins in with a piano solo at the end. Another of the band’s upbeat ska pop songs – an upbeat, bouncy thing about girls and parties, with heavy synth parts from Dolly and David. This was to be the line-up’s final recording. In the following months Jarvis, Dolly and Jamie took their A-levels, and band activity had to be suspended. When the exams were passed, it was time to go to university, and while Jarvis’s mother was happy enough for him to defer his place, the other two were not so lucky. With interest in the band petering out, the end of this particular Pulp was inevitable.